It must delve into the themes of gen­eros­i­ty, abun­dance, grat­i­tude. It should be beau­ti­ful. Com­pelling in its beau­ty, in fact. Ide­al­ly, I’d like it to cel­e­brate our bet­ter angels, but also not fail to acknowl­edge the prick­li­er parts of our nature. It need not tell The Story/History…but again—generosity, abun­dance, grat­i­tude! These are the Themes Of The Day! But there is one…and it works every time. I’ve used it in sto­ry times, wor­ship ser­vices, and hol­i­day gath­er­ings of adults and kids alike. It’s nev­er shelved in the Thanks­giv­ing hol­i­day section—but it is absolute­ly about giv­ing thanks. What’s the book you ask? 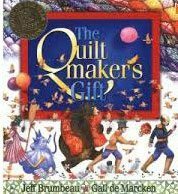 The Quiltmaker’s Gift by Jeff Brum­beau, illus­trat­ed by Gail de Mar­ck­en. I’m just fresh off of read­ing it (again) to a group of par­ents and kids. I’ve been read­ing it for years now—often in Novem­ber, but oth­er times dur­ing the year, too. It nev­er fails to sat­is­fy. When I read it pub­licly, I’m always a lit­tle ner­vous. The sto­ry is long. The pic­tures are astound­ing (and filled with clever puns and puz­zles), but it’s hard to rev­el in the artis­tic detail when you’re read­ing to a big group. Will it work its mag­ic this time? I won­der as I begin. It does. Mag­i­cal every time. Even the lit­tlest ones sit entranced. There’s a greedy king and a firm but grace-filled quilt­mak­er. There are sol­diers in their paja­mas, a fero­cious bear, and wee spar­rows. There is beau­ty. Love. All of my Themes Of The Day are covered—generosity, abun­dance, and grat­i­tude on every page! The art is gor­geous, the sto­ry thought pro­vok­ing. There is noth­ing about feast­ing or about the some­times con­flict­ed his­to­ry of the Unit­ed States; yet it is a Thanks­giv­ing sto­ry. I’m sure of it. Each year, my quest for The Per­fect Thanks­giv­ing Book ends with this book. Sure, I’d like a cou­ple more to fall back on, but this one is rich enough to sat­is­fy. I am grate­ful for The Quiltmaker’s Gift. I’ve read it to count­less wide-eyed chil­dren (includ­ing my own) over the years. They love it. They get it. Often the adults are a lit­tle misty-eyed at the end. I give extra-cred­it to pic­ture books that speak to adults in a pro­found way, so this one gets an A+. Take a read this Thanksgiving—it’s a keep­er.